Court ruling on July 12 welcomed as international observers forecast upcoming developments. Vietnam has welcomed a ruling by the International Court of Arbitration concerning the East Sea, internationally known as the South China Sea, on July 12, saying it strongly supports the peaceful resolution of disputes while reasserting its own sovereignty claims, according to a press release from the Ministry of Foreign Affairs (MoFA). 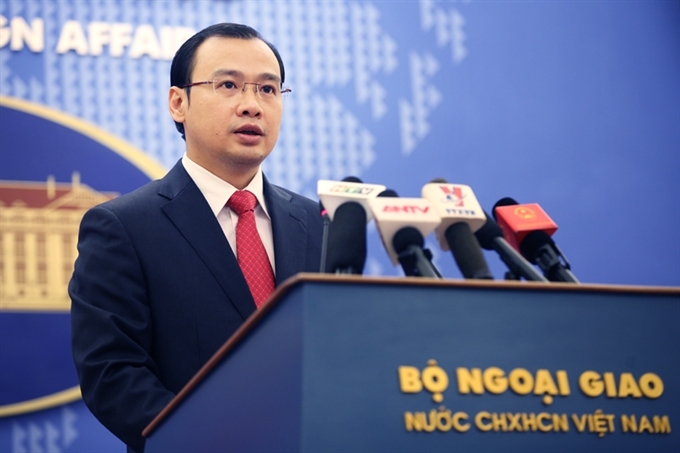 “Vietnam strongly supports the resolution of disputes in the East Sea by peaceful means, including diplomatic and legal processes and refraining from the use or threat to use force in accordance with international law,” MoFA spokesperson Le Hai Binh said in the press release. The ministry also reasserted Vietnam’s sovereignty claims over the Paracel and Spratly Islands and its jurisdiction over its Exclusive Economic Zone (EEZ). Earlier, the Hague Tribunal, in a 497-page ruling, stated that China’s claims to historic rights under the nine-dash line are contrary to a UN convention that China has ratified. The Hague also found that Chinese actions have aggravated the Philippines dispute during attempts to resolve the issue. “None of the Spratly Islands grant China an exclusive economic zone,” the Hague tribunal wrote. It also found that Chinese law enforcement patrols had risked colliding with Philippine fishing vessels and caused irreparable damage to coral reefs with construction work. The US on July 12 said that it stands on the rule of law and insisted that the ruling is an important contribution to the shared goal of a peaceful resolution to disputes in the East Sea. “We are still studying the decision and have no comment on the merits of the case, but some important principles have been clear from the beginning of this case and are worth restating,” said Mr. John Kirby, Assistant Secretary and Department Spokesperson of the US’s Department of State. “The US strongly supports the rule of law. We support efforts to resolve territorial and maritime disputes in the South China Sea (East Sea) peacefully, including through arbitration,” he said. China claims most of the East Sea, even waters approaching neighboring countries, based on a vaguely defined “nine-dash-line” found on a 1940s Chinese map. The Philippines and other countries, including Vietnam, dispute this claim. For now, upcoming developments, especially China’s next moves, will affect the region, particularly within the ASEAN bloc, according to international observers. “China will suffer considerable reputational cost from the ruling and this could help convince Beijing over the medium-to-long term to bring its claims into accordance with international law and treat fairly with Manila and the other claimants,” wrote a group of analysts at the Asia Maritime Transparency Initiative (AMTI) of the Washington-based Center for Strategic & International Studies (CSIS). China’s reaction will depend on how much room Beijing decides it still has to maneuver in the wake of the ruling, as well as the reactions of the Philippines, the US, and others, according to AMTI analysts. They also believe that China may not make any immediate moves other than publicly rejecting the tribunal’s ruling.